Cajuns and Their Acadian Ancestors: A Young Reader's History traces the four-hundred-year history of this distinct American ethnic group. While written in a format comprehensible to junior-high and high-school students, it will prove appealing and informative as well to adult readers seeking a one-volume exploration of these remarkable people and their predecessors. The narrative follows the Cajuns' early ancestors, the Acadians, from seventeenth-century France to Nova Scotia, where they flourished until British soldiers expelled them in a tragic event called Le Grand Derangement (The Great Upheaval)--an episode regarded by many historians as an instance of ethnic cleansing or genocide. Up to one-half of the Acadian population died from disease, starvation, exposure, or outright violence in the expulsion. Nearly three thousand survivors journeyed through the thirteen American colonies to Spanish-controlled Louisiana. There they resettled, intermarried with members of the local population, and evolved into the Cajun people, who today number over a half-million. Since their arrival in Louisiana, the Cajuns have developed an unmistakable identity and a strong sense of ethnic pride. In recent decades they have contributed their exotic cuisine and accordion-and-fiddle dance music to American popular culture. 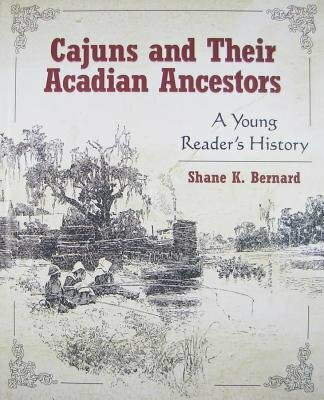 Cajuns and Their Acadian Ancestors: A Young Reader's History includes numerous images and over a dozen sidebars on topics ranging from Cajun music to Mardi Gras. Shane K. Bernard is historian and curator of McIlhenny Company, producers of TABASCO brand pepper sauce, and Avery Island, Inc. He is the author of Swamp Pop: Cajun and Creole Rhythm and Blues; The Cajuns: Americanization of a People; and TABASCO(R) An Illustrated History.